It’s a dangerous trend sweeping school campuses nationwide that every parent and teacher should know about—‘Juuling.’ Most parents have no clue what it is, but your child likely knows. A Juul is a small, sleek vaping device that resembles a USB flash drive and charges when plugged into a laptop. The trend is so popular teens are using it as a verb. They are juuling in school bathrooms, hallways, and even in class. Teens like it because they can fool adults—what a parent or educator may think is a flash drive in a student’s backpack, could be a Juul. 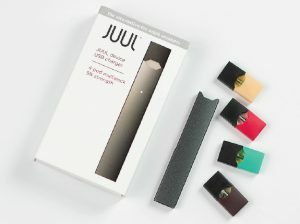 There are a variety of ‘kid friendly’ Juul pods with flavors like mango and crème Brulee, making the new form of e-cigarettes even more appealing. “There’s pretty good evidence to show kids who use these nicotine delivery devices have a higher risk of starting cigarette smoking and we have a lot of evidence about the risks of cigarette smoking,” said Dr. Deepa Camenga, a pediatrician at Yale-New Haven Hospital. But it’s not just the nicotine-laden flavor pods going into the vaping devices; substance abuse counselors warn teens can fill the Juul pods with marijuana and other substances. In a released statement, U.S. Senator Chuck Schumer said ‘Juuling’ may be even more dangerous than conventional smoking—adding that the amount of nicotine in one Juul pod is equal to an entire pack of cigarettes. San Francisco-based Juul Labs stressed its product is not for sale to minors and a purchaser has to be 21 to purchase online. An adult would have to sign for delivery. However, experts say kids lie about their age and simply use a prepaid card to buy the Juul product with no proof of age required upon delivery. While some convenience stores and gas stations are cracking down and refusing to sell the product, Schumer is calling for immediate action. The Democrat is urging the Food and Drug Administration (FDA) to implement an already finalized rule that would regulate e-cigarettes. The FDA has made it illegal to sell e-cigarettes to kids under age 18. However, the compliance deadline for new products was pushed from 2018 to 2022. Because students are juuling in plain sight on school campuses, some schools are now going as far as to ban flash drives on campuses to stop the confusion. A high school principal in suburban D.C. even removed the doors from bathroom stalls to keep students from using drugs and vaping devices inside the stalls. Many schools are also sending letters home warning parents about the potentially addictive trend. Teachers are also advised to be on alert for juuling in the classroom and bathrooms. Experts say the best thing parents can do is to talk to their child about vaping and the potential risks associated with it.